Dame Joan Plowright talks to Peter White about her career, life with Sir Laurence Olivier and her blindness. 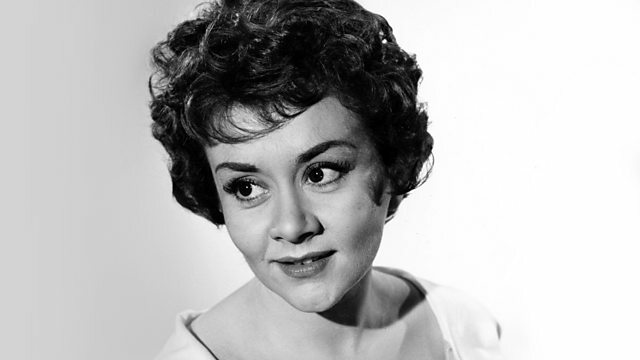 Dame Joan Plowright was discovered as a stage actor in the late 1950s before going on to have a stellar career – starring in The Country Wife, A Taste of Honey and as Saint Joan. She became Lady Olivier on marrying Sir Laurence Olivier in 1961. They were married until his death in 1989. Dame Joan took parts in film and television production up until 2014 when her worsening eyesight compelled her to retire. She lives in her home in Sussex where she and Sir Laurence came to live once he had retired. She openly speaks of her career, her life with her husband and family and her attitude towards her failing sight. That’s the bottom step and the next one’s the tiling. Would you like to come and sit closer to her? Let me come and say hello. Well I could go around the table down to him, there’s a chair. How do you mean properly? Well blind people shaking hands is always a bit of a performance isn’t it. It’s lovely to meet you. Thank you, it’s lovely to meet you too. I’ve listened to you a lot. I’m very flattered. I’ve listened to you quite a lot as well. It’s very nice of you to allow us into your home at Christmas time. Well you’re very welcome, best place to do it. Just, while we’re standing here, can I just ask you about this house because it is obviously very special to you and it’s a lovely house and as a blind person, I’m just trying to get a feel for it. No, we’ve had it for – well over 50 years. And this is where you were with Sir Laurence. Yes, it was a weekend place. We lived here often in the summer when Larry retired, then he wanted to be here more than he wanted to be in London. So, it became much more of a – the central place. I couldn’t help noticing when we came in that in some ways it’s not the easiest house now for someone whose sight is getting worse is it? We came over a kind of stile coming into your back door. Oh that’s right, you went in – you went in to the paddock. Is it tricky now, as a house, to get around for you? Well I know the stile – I put one hand or someone puts my one hand on the one post and then I feel for the other and then I know I’ve got to put my knee up high to climb over the first. I know it, so once you’ve practised it, you’re fine. I’m not quite sure how poor your eyesight is. Well it is pretty poor. No, I can’t see very much. I mean I can see the difference between light and dark, I can see the shape of somebody in front of me but no details of colour or what they’re wearing or their face. So, what about your photographs, for example? …your way of doing things. From London we present a World Theatre Production – The Country Wife – a comedy by William Wycherley with Edith Evans, Joan Plowright and Clive Revill. We’ve moved upstairs now to Joan’s study. The sad thing is we can’t hear the crackling fire now. It is a lovely house and I’m just wondering – it’s a long way from Scunthorpe, isn’t it, here in the heart of Sussex and it’s a long way from the lives of some of the people whose parts you played in the early part of your career, I’m thinking of Josephine in a Taste of Honey. It could hardly be more different could it really? No, one plays many parts and you know you live many lives or you certainly do in our profession. It became the place for us all to meet on holiday occasions, special seasons, special birthdays. There is a gate just in the lane there going into a field, because it’s rural around here and it’s small farms – dairy farming – and there were cows in that field we used to go and watch with the children. And it was where we saw the sun go down every night in the summer and we would collect there at the gate at whenever time it was and the call would go out – sunset gate – and everybody would come from wherever they are and climb on the gate and wait and watch the sun go down. It was a very happy place. So, it really – it was a bit of a rural idyll for you was it? Yes, it was. It’s very peaceful. It’s quite hard to find, it was okay when we were very young and trying to escape from being on show. I know Larry used to give instructions to people how to get here and say, you know, you will read them and learn them off by heart and then eat them. You were hugely well known, weren’t you, I mean Sir Laurence in particular. Yes of course but there was the other side to him as well, which was going to work in London when he was Director of the National Theatre, leaving home in Brighton with his briefcase and going to the station and looking like just a businessman going to work. He didn’t really want to be recognised outside unless he was doing something that needed an audience or something for charity or obviously a performance in the theatre – fine. To have to carry it on after the show is over, it’s too much of a strain really, you’re not quite sure which personality to put on for people of course. You know an actor has many people inside him, which hopefully he gets to play them all. And what about for you trying to bring up a family, lead as normal a life as you can, it must have been – it must have been really quite tricky with that glare of publicity. It was very tricky, you know, not being able to be there on certain occasions like birthday parties or plays at school or sports day. Most of the time one of us tried to do it and most of the time we succeeded but it was hard not to feel guilty if you missed it. Could he change a nappy? Oh yes, and he took a lot of fun [indistinct words] but he would always be very persevering. I’d like to ask you about your eyesight because let’s face it this is In Touch and it’s one of the reasons we wanted to talk to you. When did you start to realise that you’d got a problem with your eyes? Well I was short sighted, I had to have glasses for driving and then suddenly the pressure was up and I was being advised by the opticians and then they said maybe you should go and see an eye specialist. And I started having treatment, it was in one eye, for glaucoma. Because you can still see pretty well, you’re not aware of anything happening, it isn’t something you are aware of, you can see perfectly well with one eye. I was in America, I was in Los Angeles, filming a TV show when the Rodney King riots happened and there was a week of rioting and troops were called out and they were burning down shops and stores and offices and I was in the Beverley Wiltshire Hotel with the author and the director. And you were allowed out to walk round the block of the hotel and then back in with security guards on because the rioters were spreading and got to Hollywood and nearby and we were not allowed out. Anyway, we’d done this walk round and my eyes were feeling a bit sore and I looked in the mirror to do eye drops and then was going down to dinner, so I was going to do an eyeline and I closed one eye and did the other, then I closed the other and suddenly I couldn’t see anything. And one eye had lost sight, except for a tiny sliver of light out of the end of the eye. And I went to the Jules Stein Eye Institute at UCLA in the morning in Westwood where they said to me – When are you going back home? Well I said, I’ve finished, I’m going back tomorrow. They said – Well, go straight to your eye specialist because if you have to stay here any longer we’ll have to do the operation here, you need an operation. So, it was a great surprise to me. I hadn’t been doing very regular check-ups, so one should urge people to keep at it. And when did it begin to affect the way you worked? I can’t remember which film it was but I was suddenly aware that it was very difficult to make sure if I was pouring out tea or water or drinks that I would actually hit the glass or the cup. It’s all very well to say well you can do it again but these days there isn’t time for people to do 15 takes in order to pour out a cup of tea properly. So, you have to then start being careful when you read a script about saying whether you think you can do it if you have a discrete word with the director and see what might be required of you which you can do. But otherwise you know you just have to choose very carefully. And then there comes the time when you think – do I let people know about this or not. And in our profession, of course, it’s better not to if you can manage because then you still get more parts to play. But once there is difficulty of seeing somebody at a distance, somewhere behind the camera and you cannot see where they are it would be obvious to people that you can’t see that far. What they can do, in certain circumstances, if you’re lucky enough to have friendly directors and they’ve got plenty of money, is you put an electric light on the chest of the person you’re supposed to be looking at and I follow the light with my eyes. And how accommodating were directors? They were terribly sweet actually and men on the crew would suddenly leap up and say – look, I’m over here, here’s the light. They would offer great help, which was very heart-warming. Did you have to turn some parts down? Yes, I did have to turn parts down but I can’t give examples because those actresses don’t know that I had the script first. And maybe listening. You had to refuse to do those television interviews on chat shows, where you’re supposed to walk down a flight of stairs before getting to a seat. There is no way I could walk happily down a flight of stairs to say hello to a chat show host. So, I would have to say I have to be discovered sitting or I can’t do it. And that’s difficult because naturally the people who are promoting a film or a show need you to do the publicity. That is true, yes and you don’t really have to have makeup and hair do for radio, which takes up another two hours. But you did do some makeup for us. Well I did actually because I didn’t know how much you two could see. You needn’t have bothered, we can’t see very much. No, I know, I know now. I’m sure it’s very good though. I guess you feel better for doing it. But why did you stop in the end because you did announce that you were retiring from films? Because I couldn’t pretend anymore. Once I knew there was no sight in one eye and the other one was getting more intensive with the glaucoma then you have to make the decision and realise that life is going to go in a different way and make a preparation for it. When I say make a preparation, within yourself, an acceptance and the decision to have a good life anyway in spite of it and find out what you can do and enjoy and go after that. It must have been a wrench though. It is a wrench, yes, but it’s something everybody has to make at some time in their life and when you’ve had a very good life and been lucky or fortunate, which I have, you do say well it’s my turn now and I will build up the strength to deal with it because the people around me are all being very sweet and helpful and I must make the effort to make sure that their work is not defeated. And so, what are the things that you are being able to do that perhaps you couldn’t do before, what are the things you do get pleasure from? Well, obviously, going to the theatre. I do go, I have to say to my friends – please try and be in a play in a theatre with a box because then I don’t have to stumble over feet in the stalls. And I can sit with a friend who can whisper to me when the stage set changes or the electric lights do something peculiar because I can’t really see the production. I can see shapes moving across but no faces. So, it’s the text I listen to. But that means I’m back in the atmosphere and I love that. Then I go – here we go for walks a lot, I like the promenade by the sea, do Pilates and yoga and keep fit. You’ve done a lot of things, you’ve won awards in your own right, I just wonder what you’re proudest of? Oh lord, that’s difficult. I mean I loved being part of the National Theatre when it was first started because that was a very idealistic way of life. It doesn’t exist anymore. Because it was something that Sir Laurence always wanted to do, it was very important to him too wasn’t it. Yes, it was the culmination for him of a great career and his needing to pass something on to the younger generation and the need for training and artistic discipline, as well as courage and audacity. You did play quite a big part in that, didn’t you, I mean I get the feeling that you were in the background keeping things on a bit of an even keel. Yes, it’s true. I was the kind of middle man because I had been a member of the Royal Court Company founded by George Devine and Tony Richardson ever since I’d first studied at the Old Vic Theatre School and George Devine had been one of my tutors. And it was he who therefore really set me up on my career. And when Larry came to the Royal Court to do The Entertainer, he joined up again with George Devine, they had been actors together at the Old Vic years ago, and in a way when he and I got together, Larry and I, I mean, and the National Theatre was going to be formed he really took the company that George Devine had founded. So, it was my generation he took in as assistant directors, so I was a link really, if those younger directors were fuming at the mouth because of something Larry had done or said they would come and complain to me because they daren’t complain to him. And of course, I could then smooth it out, as it were. I was rather missing the crackling fire, so we’ve come back down into this lovely room at your house. I just wondered – what about your own legacy? I’ve noticed you do this in other interviews and you’ve done it to me – I ask you about you and you talk about Sir Laurence. What about your own legacy and the things perhaps you think – I did that and it was good? Yeah, well, I did a lot of things that I thought were good. I mean my first success was the Country Wife and mainly of course there was Saint Joan. Why do all these knights and courtiers and churchmen hate me? What have I done to them? I’ve asked nothing for myself except that my village shall not be taxed for we cannot afford war taxes. I’ve brought them luck in victory. I’ve set them right when they were doing all sorts of stupid things. I’ve crowned Charles and made him a real king and all the honours he’s handing out have gone to them. Then why do they not love me? And that is the sort of part every young girl aspires to play. And when people say – did you enjoy playing Saint Joan – you’d say – I enjoyed having played it but actually doing it was very, very hard work, absolutely exhausting. Just on the effect of losing your sight, you’re very level headed about it, are there any aspects of it, any physical aspects of it that have alarmed you? Hallucinations is probably one. There was one time, not so long ago, when I seemed to be attended by dark shapes. To begin with, of course, I thought it was one of the family who’d come up to see if I needed any help. And they were just like a shadow. My eye specialists tell me that yes that was a phase when people did see those kind of shapes. It gets a bit, you know, tiring. I would lose my temper sometimes and talk to them and say – look if you’re going to stand about here do something to help, hang up some clothes or something, don’t just stand around because they irritated me finally. But then they disappeared. And this is, of course, what they call Charles Bonnet syndrome. That’s the proper – that’s the medical name. Oh, I never got a name for it. Did you not get a name? No, it’s got a proper name. And lots of people see them. Yes, he was a French doctor, I think 18th century and he identified them. Well I shall have to tell my eye specialist, it maybe something he doesn’t know. Maybe it is, but he should listen to In Touch. Because we do talk about it. What about gadgets Joan, I mean there’s lots of stuff around, I wonder if you bother with any of it or if any of it is of any help to you? Well I’m spoiled, I’m very fortunate. I just have buzzers to call people. But the only gadget I would like to have is a kettle with a curved thin spout so that I could direct the water straight into the mug or bowl or cup instead of it gushing out of this wide opening which is all the ones that I have. …to a locker in a car park at Media City because that’s how they do things nowadays. Unfortunately, when we went to open the locker it said that our pin number that we needed to unlock the locker was not valid. And so, there is a kettle with your name on it in a locker in a car park in Media City. So, if we ever get it out Joan, it’s yours. Oh well, thank you very much. In fact, we waited – we waited for our train for over an hour last night in an attempt to get it out and we then tried to order another one. So, somewhere there are two kettles going round the country. Well that will be wonderful, I’ll have both, if they arrive. Well that’s our – if they arrive – that’s In Touch’s present to you, In Touch’s Christmas present. Well how very sweet of you. Thank you. I mean you do – you have talked about it – you losing your sight – very – again, I keep using the word level headed, but it just seems appropriate with your attitude – you don’t seem as saddened by it as some people are. Well I still have a life that, what is it, the desiderata which ends, you know, saying whatever is going on in the world that is terrible, the world is still a beautiful place. And it says – be careful and strive to be happy. And that’s it, you have to work at being happy. You were quite adventurous, you have always liked to explore things, take a risk, is there any sense in which you see – see this as an adventure? Yes, of course, it’s how you can deal with it, what the poet Yates called the fascination of things difficult. You can look at it in that way. It is fascinating to try and find out how you can cope.